Eye shadows are produced as powder or creamy product. Colored facial products are available highly viscous lotion or a foundation, which is often finished with a facial pressed powder. Finding the right skin tone takes time and once selected it is expected to be the same at each purchase. Color consistency is a key quality criterion for a successful product with a long lifetime. Powders, pastes and liquids can either be measured in mass or in case of lower viscosity products as drawdowns on test charts. In both cases a noncontact measurement technique will be the preferred method since this technique correlates best with how the consumer perceives the final product in the store. Powdery eye shadow and facial powder are pressed in “shape”. For production quality control a standardized technique needs to be established in order to always maintain the same plunger pressure as well as the same plunger tissue. It is recommended to use a fine-woven fabric, which will leave no or as fine as possible texture on the surface. A smooth and non-textured surface allows an objective measurement of the color hue and the sparkling behavior of effect pigments. For this purpose a sample holder with disposable round dishes was especially designed. The powdery material is filled and pressed based on a standardized technique into the disposable dish. The sample holder comes with an adapter ring for a cup size ∅ 35.5 mm, height 4.5 mm. To use the holder with other cup sizes, customized adapter rings are offered with a maximum cup size of ∅ 60 mm. The holder is available with different instrument masks to allow objective color and gloss measurement. The instrument mask is custom made to fit the aperture of the respective instrument guaranteeing repeatable sample placement and measurement results as well as non-contact measurement to protect the instrument’s optic. The same sample holder with a round dish as described for powdery products can be used. An alternative would be the sample holder liquid paste (see lipstick), which can also be easily cleaned and comes with disposable plastic spoons instead of a round dish. For repeatable results the same amount of paste needs to be poured into the round dish or spoon by means of e.g. a syringe. Care must be taken to achieve a smoothand homogeneous surface. Both sample holders are designed to ensure a non-contact measurement of the material by placing the instrument on a mask to ensure centered positioning. A light barrier prevents entry of ambient light. Please note that measurements through a glass plate or in a closed glass cuvette do not correlate with the perceived color. The glass cover will change the color and gloss measurement results. Therefore, a non-contact measurement is the better measurement choice. 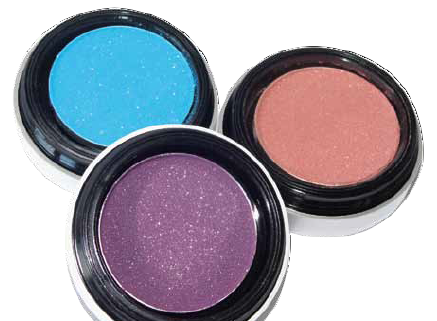 Eye shadow using the new MIRAGE effect pigment line from ECKART was compared to products using natural mica based pigments. MIRAGE pigments will create a glamorous look and extraordinary sparkling effect. 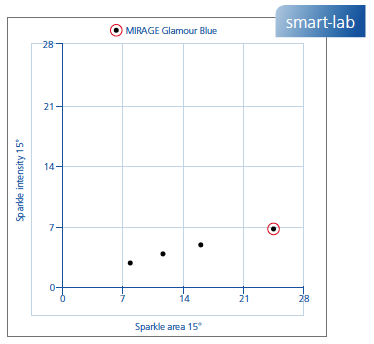 BYK-mac i measurements of MIRAGE Glamour Blue show a much higher sparkle area and sparkle intensity value than a traditional mica pigment. • Stir foundation paste for uniform dispersion shortly before applying. • Use automatic film applicator as draw down speed and pressure on the applicator tool will always be the same. A special wet drawdown template was developed for placing the color or gloss instrument onto the sample without contact. For ease of handling the template is made of easy-to-clean hard-anodized aluminum.